A truck that uses a cake ingredient as one of its key power sources will go on trial in the UK next year. Built by Chelmsford-based Tevva motors, the truck will feature an engine that runs on a form of glycerine, along with a range-extended battery pack. Tevva’s CEO, Asher Bennett, a former Israeli submarine commander, has received over £2m in funding from the Low Carbon Vehicle Partnership to develop the technology. He believes the glycerine range-extender vehicles will be the world’s first fully zero-emission trucks. 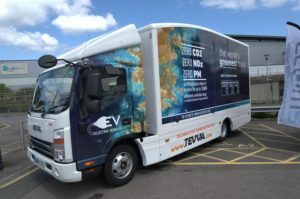 The latest innovation will join Tevva’s existing range-extending technology for electric trucks, which use a powertrain similar to that developed for the new London Taxi, where power is supplied to the wheels via electric motors and backed up by a diesel-powered engine that removes the barriers of limited range, seen as one of the key barriers to hauliers adopting fully electric technology. The 7.5-tonne truck is capable of travelling from London to Carlisle without the need to recharge or refuel. Delivery company UPS has successfully trialled one of the trucks in London and has placed an order for 15 more. Tevva is also the company behind active geofencing, an online system that detects air quality in urban areas and can automatically switch a vehicle’s powertrain between diesel and electric power depending on particulate levels. The system is currently being trialled in Leeds.